Matt’s latest hobby is fermenting foods. Now in addition to big vats of beer, we have jars of vegetables lining our basement shelves. Here’s a bit more about what he’s been up to. There’s something I can’t explain about my love of fermentation. When I get into casual conversations about baking and brewing I usually talk about the blend of art and science. 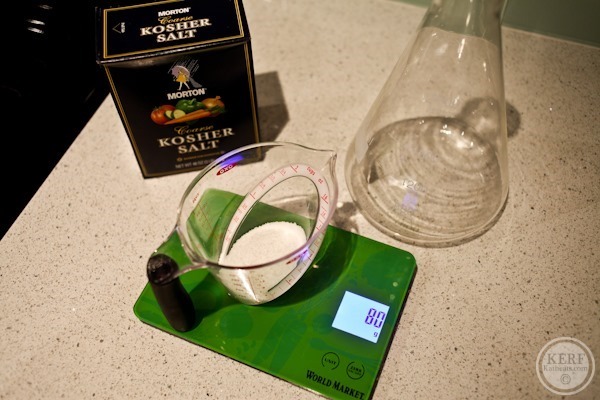 We meticulously and precisely measure ingredients according to recipes that read like formulas, but then you give it to the yeast and something wild happens. It’s in their hands now and while you can guide the process of fermentation, in a way I feel out of control. When I ferment things, I feel like I’m tapping into ancient history. It’s one of the oldest food preparation methods we have because fermentation happens almost without our intervention. The world is covered in bacteria and the very organisms we need for fermentation happen to be attracted to the foods we’re trying to ferment! Grains are covered in the bacteria we utilize to make sourdough, grapes’ fauna turn juice into wine, and vegetables have their brothers in pickling readily available! 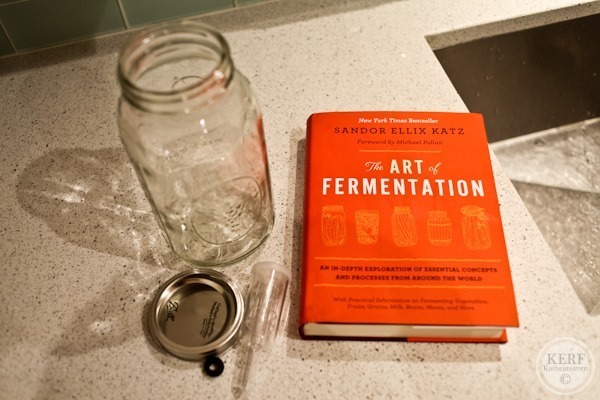 I heard about Sandor Katz’s book Art of Fermentation when he was interviewed by The Brewing Network (where I pretty much get all of my homebrewing info). What especially attracted me was the way Katz talked about the coevolution of humans with the bacteria around us. We think of ourselves as individual units but there are hundreds of species of bacteria living inside us, each of them contributing different enzymes, or making our food more digestible, or outcompeting pathogenic organisms that invade our body. He even suggests that the sterility of modern packaged food may have decreased our intestinal flora so much that this could potentially be the source of the huge wave of food allergies. 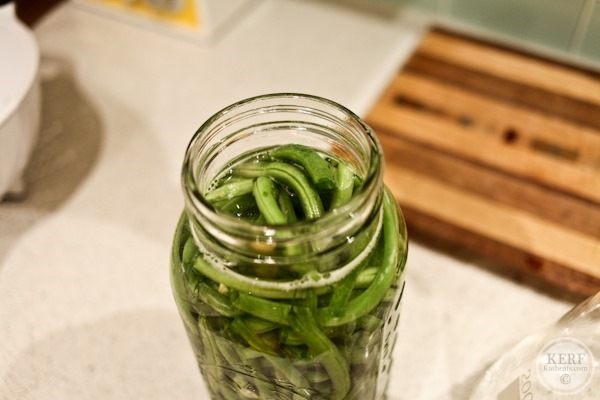 I decided for my first fermented vegetable experiment I would make some green beans. To start I had to get a fermentation vessel ready. I bought a half gallon mason jar, an airlock, and a rubber grommet. I drilled a half-inch hole in the lid, pushed the grommet in, and voila! Then I put some sanitizer in, and sanitized all my other equipment. I bought 1.5 pounds of organic beans, pinched off the tips, and rinsed them in a colander. Next I prepared a brine solution for fermentation, which was 5% salt by weight. Since I knew the beans would take up some of the volume in the jar, I prepared 1600ml of brine (so that would be 80 grams of salt and 1600 grams/ml of water). 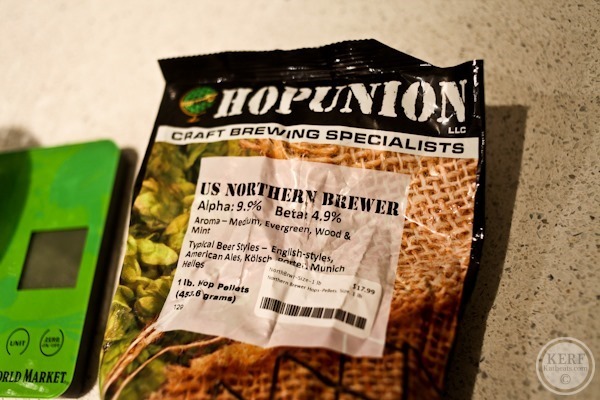 For some extra flavor I sliced three small garlic cloves and put in 5 grams of hops! 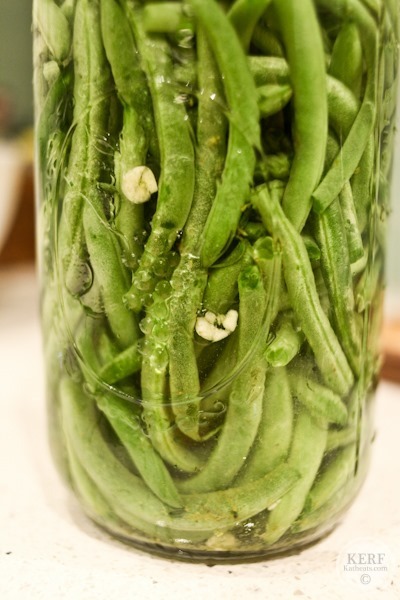 I started stuffing the green beans into the jar on its side, hoping that this would make them lay flatter and allow me to pack it tightly. Unfortunately because of all the curly beans this didn’t really help that much. I continued packing as tightly as possible up to the shoulder and then poured the brine solution in. 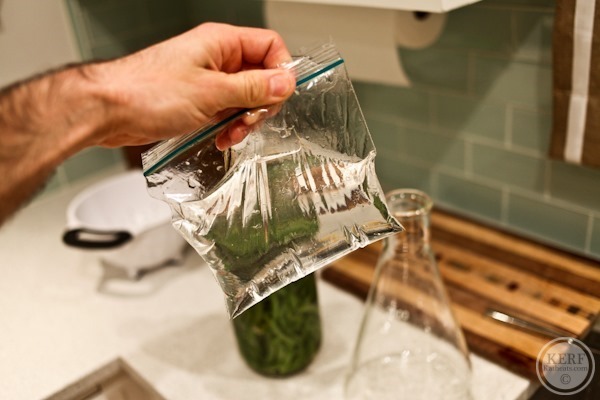 Then I poured just a small amount of brine into a plastic baggy and placed this on top – the idea is to completely submerge the veggies under the liquid. What we’re doing here is creating an oxygen-free environment that will allow the fermentative bacteria to grow and transform our food while excluding harmful organisms. Under the liquid, lactic acid bacteria will consume and transform the food, produce acid and other flavor compounds, and outcompete other organisms. Katz cites numerous times that there are zero documented cases of food poisoning resulting from fermented vegetables, so don’t be scared! Compare this to how many spinach recalls you’ve heard in the past few years. I let the beans ferment at room temperature for a week, and then moved them to several smaller jars. It was a great first experiment. I think I could have let the fermentation go a bit longer – the beans certainly got a little less crunchy, took on some of the salt and hop flavor, and too much garlic! I wonder if more time would balance all these things out. I’m pretty excited to ferment more stuff – the procedure couldn’t be simpler and there are so many things you can make. Next up is pickles and ginger! Pick up the book if you’ve been thinking about getting into ferments – I feel like I’ve discovered an unexplored culinary world, and have further attached myself to an ancient art! Definitely share how the ginger turns out! Matt, you are quite the scientist! I kind of hope I find a guy someday that has hobbies like this – not only are they interesting but you get some pretty great stuff out of them at the end! That’s pretty awesome. Can you give me an idea of how you eat/incorporate fermented vegetables? Once fermented the “cooking” process is complete right? So are you going to sautee these or eat them straight out of the jar? Do they taste pickled? What other foods will you ferment? Forgive me, I’m sure I’m being completely daft right now, but other than pickles I can’t think of any fermented foods. I expect that most of the things I make will just be snacks by themselves… crunchy pieces of beans, cauliflower, even some pickles (cucumbers) are a great snack for me. I’ll probably eventually make some hot sauce with fermented, pureed peppers. And I’d like to have a base of fermented herbs that can quickly be mixed with some oil for a unique salad dressing. Yep, everything definitely tastes pickled! Tangy acidity plus the salty brine, and any other seasonings you add. While not specifically green beans, we have a fantastic restaurant in Chicago where the chef is really into fermenting and pickling and because he uses predominantly local food, he uses them as components in the dishes in the winter time when there isn’t much variety in what is available fresh. It ends up being really delicious because that briny flavor can be a good accompaniment to a lot of dishes, especially to cut through richer cream sauces. What is the difference between pickling vegetables and fermenting them? Do the green beans taste sort of like a “green bean pickle” or is it a different taste all together? “Pickling” is truly just a generic term for preserving vegetables in a brine. But the more common method of pickling is making a brine that also includes vinegar (itself a fermented product btw) and cooking the foods in jars. What I’m doing via fermentation has more complex flavors than using a prepackaged vinegar. 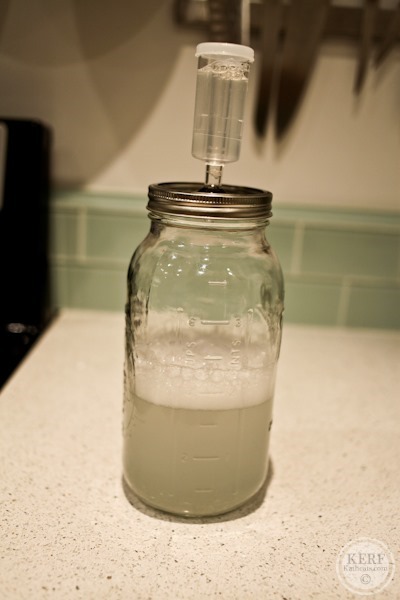 The use of vinegar kills the bacteria that fermenting depends on. A really great blog to read regularly that breaks down the mystique of fermenting for me is phickle.com. These look so good! My mom is from Romania and her family used to make homemade pickles a lot (they don’t taste like American pickles but they’re pretty tangy and delicious). I’ve been craving pickles and bitter things like this so I bet I’d love those green beans. I tried spicy pickled green beans a few months ago. They weren’t homemade but I think they had some jalepenos in there. They were amazing! Interesting project! I’m also quite curious about what the final product tastes like/how you use the fermented veggies. Looking forward to hearing more about it! I have been looking at this idea for awhile. I started out making water kefir( LOVE it) and I have made sauerkraut many times so I think it’s time for something new. I read on the website where I bought my kefir grains that we should not ferment two different things at the same time in the same room and wonder if you have read that too. I put my kefir in the laundry room while I make yogurt in the kitchen and these things worry my husband who wonders what on earth I am really growing in all my jars. I wouldn’t worry too much about it, though I will say that I’m being extra careful to keep my wild fermentations away from my beer fermentors. My thought is that each pickling environment is self-regulating. Katz almost suggests that food wants to become good pickles – it’s hard to mess up unless you have too much oxygen exposure! 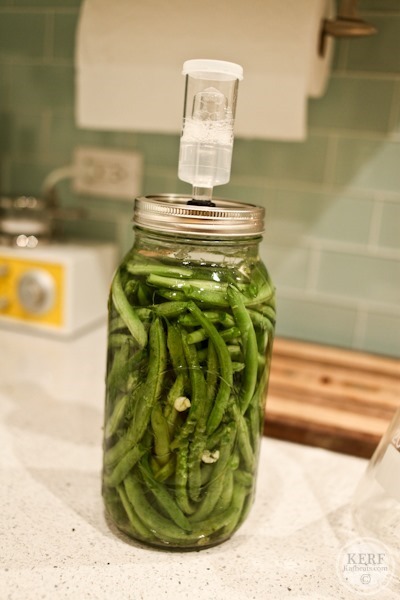 Did you put yeast in at some point for fermentation or was it all wild from the skin of the green beans? What is the effect of fermentation on food? I assume it’s different from just pickling or canning/preserving. Does it preserve the food? Make it taste different like pickling does? Make it alcoholic? I’m confused as to what the actual outcome is/is for. Read one of my comments above that it is a form of pickling. No alcohol produced (or maybe a negligible amount). Great Post Matt. I am wondering about the contraption on the top of the jar. Looks like you are trying to prevent any oxygen from entering the jar..? 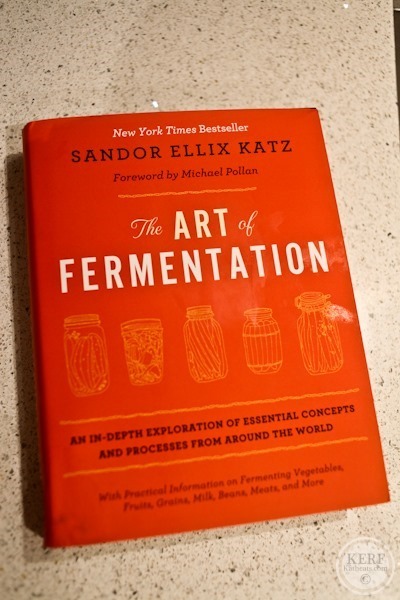 I have the book The Art of Fermentation (which I haven’t cracked upen yet) as well as Katz’s earlier book Wild Fermentation. I have been fermenting veggies and fuit mixtures for a few years but I always just use a lid. I am intrigued by your clever contraption. If you get a chance please do share! Ahhh…I see now after reading the post again (and more carefully) that you are indeed trying to keep an oxygen free environemnt. Again I have always used a lid and the salt brine has been enough to keep the bad guys at bay. I am still intrigued though! Oxygen free isn’t necessary is it? Mold is something we want to avoid and it needs oxygen – the airlock is just a more thorough method of keeping it out. But honestly, in my latest ferments I’ve gotten rid of the airlock and just loosely affixed a mason lid. Check out Nourishing Traditions, it has some history on fermenting as well as some interesting fermenting recipies (most libraries carry a copy). My favorite recipie is a Papaya Chutney-ish dish. Meant to be served with meat (to help with digestion). it has onions, peper, jalepeno mint, cilatnro, giniger…delish. Everybody loves it. It really opened up my mind on what could be fermented. 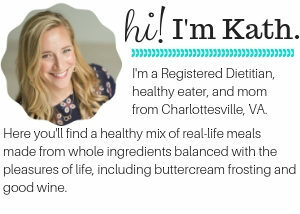 I’m going to echo Kimberly’s question above… what sort of taste/flavor do fermented vegetables have? Just curious! I’m never really heard of this before, but it’s really interesting. Imagine using a really fancy, complex tasting vinegar to pickle something – It’s like the difference between grocery store orange cheddar cheese and something that costs $12 a pound! My sister-in-law gave us a huge fermenting crock for Christmas…I can’t wait until spring, so I can make some sauerkraut. It should be a fun and interesting process. I bet they’ll taste INCREDIBLE!! I love fermented/pickled foods! Sauerkraut, pickles, pickled eggs (which I eat one of almost daily 😉 )… However, I’ve never done it myself – I should definitely check out that book. 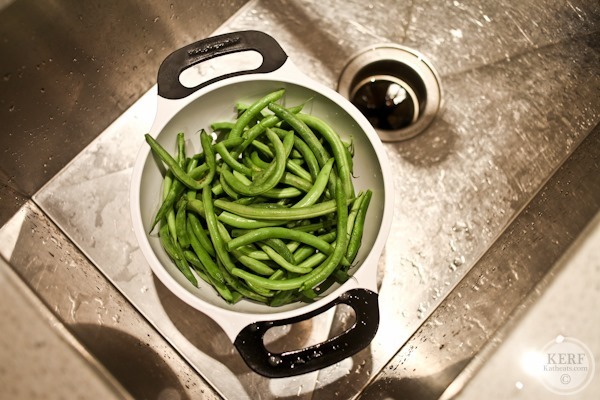 I’d love to try the green beans, as they’re a favorite vegetable of mine. Fabulous post. Your string beans are delicious. I love the photo of the jar on its side. 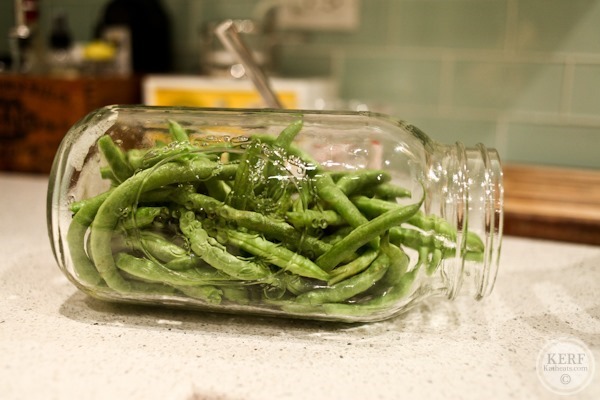 String beans in a bottle kind of like ship in a bottle. How fun! One of my goals is to get back into fermenting this year, I adore homemade sauerkraut on salads and would like to get more creative with other foods. I recommend making saurkraut with caraway seeds in it! mmmmmmmm. Another good combination is grated carrots with ginger. Enjoy the fun of fermenting! Our favorite wine is Le Cuvier in Paso Robles, CA. The wine maker uses wild yeast fermentation, and the wine is incredible, and no two years taste the same. He also ages his whites for years and you drink them like reds. It’s the best wine I’ve ever tasted (and my sis lives in Sonoma). You should try it out sometime, I bet you’d appreciate the process! I just saw My Darling Lemon Thyme post a recipe for homemade sriracha, which is fermented. It looks so good! You should definitely try a hot sauce! Very interesting stuff; I definitely recommend listening! I bet they’re tangy and delicious! I’ve just started brewing my own kombucha at home, and it’s been one big fun science experiment to play around with second ferments, added herbs and fruits, and different tea varieties. “We are, each of us, a multitude.” Carl Sagan said that about the human cells that make each one of us, but it also applies to the bacteria that are a part of us. You guys should check out some good Korean restaurants (there are a bunch in NYC). It’s all fermented/pickled, all the time! are my go-to’s for ferments! I really want to try fermenting food now!! I love pickles and fermenting stuff! Have you seen the book Wild Fermentation? It’s zany but awesome. I love the idea of adding brine in a baggy! I’ve tried fermenting cabbage a few times, but my house isn’t very warm in the winter and I’m not sure anything is happening! Thanks so much for writing this, Matt. I love fermented foods, but haven’t tried making them on my own probably due to a lack of knowledge, and worrying that I might do something wrong and get sick! But this review was extremely informative and I just ordered the book. Can’t wait to try it! I absolutely LOVE anything fermented! My family thinks im crazy, but im always up for a good pickled or fermented veggie. Kim-chi, anyone?! My wife has been fermenting for over a year now. 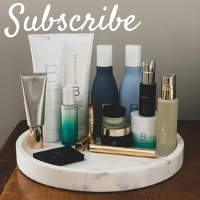 We love everything she’s done so far! After reading your blog on the beans, she says that more time will balance out the flavors. I just completed my first try at making sauerkraut. I used 2 gallon jars to make it in. One jar was 1 head of cabbage (shredded) and 2 tablespoons of pink Himalayan salt and the other jar was 1 head of cabbage (shredded), about 3 cups of unpeeled shredded carrots and 2 tablespoons of Himalayan salt. I mixed up each batch separately. I added about 1 cup of brine to each made with(1 tsp of salt to 1 cup water). The cabbage and cabbage carrot mixtures were not covered with brine/juice but came up to about half way to the top of the shredded veggies. I then put some water in 2 freezer bags and pressed out the air and used them as weights on the shredded veggies and then placed the lids loosely on the jars. I kept the jars in the kitchen at about 65 to 70 Fahrenheit for 12 days. No mold developed but they did not bubble up either. The jar with cabbage and salt only tastes great but the jar with the cabbage, carrots and salt tastes strong and unpleasant. Can anyone tell me what might have gone wrong with the cabbage, carrot mixture and is there any way to save that batch? Appreciate the help.